Cal Worthington, the man responsible for the best used-car commercials in the history of television is dead at the age of 92. If you watched television in Southern California in the 1970s and beyond, it was impossible to miss Cal Worthington, the lanky pitchman in the cowboy hat touting deals on a sprawling car lot with his "dog Spot." "Spot," however, was anything but a dog — think lion, tiger, bull, penguin, anteater, iguana, even a whale. 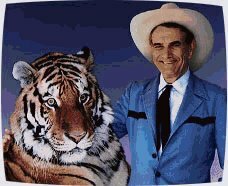 And Worthington, the Oklahoma transplant who rode and wrestled with the exotic creatures in one of TV's wackiest and longest-running ad campaigns, kept the gag going for decades, building a cult following along with one of the most successful car dealerships west of the Mississippi. "Go see Cal" became a part of Southern Californians' vocabulary. If you had cable TV in Santa Fe in the '70s chances are you saw Cal and his dog spot too. Back then the cable system mainly ran L.A. stations. I thought Cal was a genius. I just regret I never had the opportunity to buy a car from him -- and maybe get a free elephant ride for the kids.